Did you ever wonder or did this ever happened to you that you were going through you old viber massages and suddenly you have found a thumbnail picture then you clicked on it, but unfortunately what you saw in "File not found"? And thought to yourself that what nice it would be if you could find that picture out! Well, don't worry any more. In this post you will find out how easily you can get all those pictures and get lost in your old memories (hopefully the nice ones). Before I tell you how to get there, let me tell you what rally happens when you send or get any picture via viber. It actually creates a small version (you can still see and identify most things) of the big picture every time you send or get via viber. 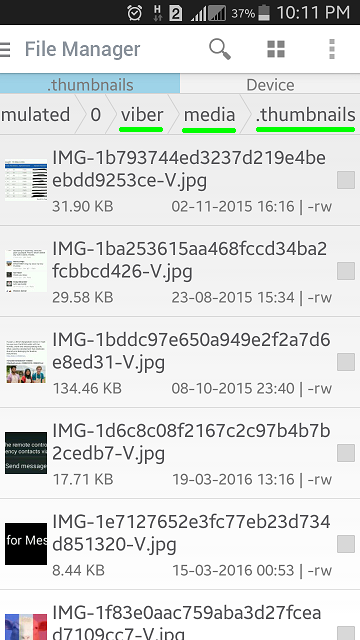 And those small pictures are called thumbnails and it get saved in a folder called .thumbnails which is in media folder of viber. But you can't see this folder without using an app or other complicated settings. You usually see like the picture below. As you can see there is no .thumbnails folder in it. Any way let's get into it. 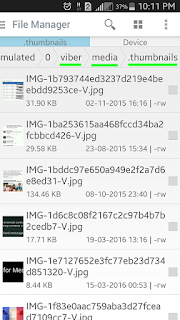 You need to download an app called File Manager and install it. It's a quite good app, and it's been downloaded over 50 million times. Note: By the way, this is for Android users only. I'm not sure about other operating systems. 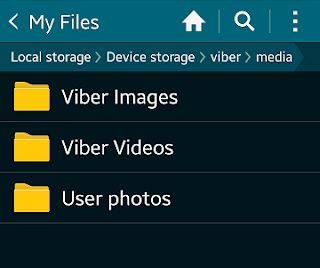 Open the app and go to Device >> Then look for a folder called viber >> Then go to media folder >> Then in this folder you will see a folder called .thumbnails click on it. And now you have reached your destination so enjoy! One more thing I want to say that please don't start deleting everything you see, specially the program files and folders. Your phone might not work properly if you delete any of the program files/folders. If you are not a programmer then it's better not to touch those files and folders. But don't worry about the thumbnails, because nothing will happen if you delete them or copy them to other folders.